OK guys, you have 1 minute to introduce Burmese Color Words to the World. beare2 hma2 leare3 -- where is it? -- Where is the white shirt? However, you cannot omit the suffix youn2 with non-primary and less common colors such as pink. The word "pink" is a coined word using pan3 "flower" and youn2 "color". Pink means flower color. Aqua is made of three words sain3 "green" + pya2 "blue" + youn2 "color". Purple is the color of the egg plant kha1-yan3 or "egg plant" + youn2 "color". youn2 "color". The word nu1 (adjective) in "light green or "light blue" refers to tender new leave that has just sprung up. The word yin1 (adjective) meaning "mature" is used to describe darker colors. a-pya2 yin1 could be understood as dark-blue color. The most frequently used color word in Burmese is probably Gold. In the tone system, I spell it shway2. Official spelling in English is "Shwe" as in "Shwedagon Pagoda". It is common for elder Burmese men to dye their hair a-net or a-meare3, which both mean black. Nowadays, it is fashionable for younger people to dye their hair in all kind of colors. For example, a-pya2-youn2 means blue, and hair a-pya2-youn2 thun3 deare2 means having streaks of blue color hair when looking at it from certain angles. The word thun3 in this context refers to "tinted" with color. Cosmetic industry has its own fancy color names that are yet to be standardized in the dictionary. This is unlike the language of the web pages in HTML where several colors are named and standardized by W3C with exact coding and RGB (Red, Green, and Blue) ratios. In automotive industry, companies like GM and Ford (both now have showrooms in Yangon) have their own color conventions with exact formula. In Physics, the spectrum of colors as a result of refraction of white light can be described by exact wavelengths. However, physicists are not to keen in giving fancy color names to different wavelengths. If they had, they probably would have come up with Greek sounding names like "hadrons", "mesons", "bosons' and so on. Exactly how did those naming conventions come about, colors or otherwise? In several cases in my recent memory, new words are started by just one credible source or a popular person, and the rest of us happily use it. When physicist Murray Gell-Mann invented the word "quark", he had in mind the cry of the gull which also rhymes with words like "Mark" and "bark". Obviously, he was also thinking of "qu" word in "quantum". The word is now universally accepted. Language as defined by the dictionaries lags behind industries and new trends. And when it comes to color conventions, its no exception. No standard dictionary will describe the color of rose or pink as having such and such exact wavelengths and primary color ratios. 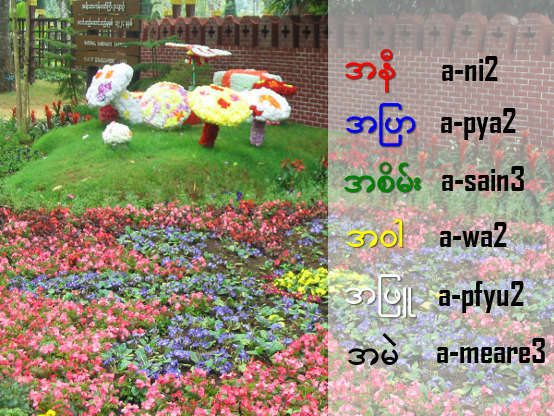 Although there are no standardized Burmese words for several colors, we still need to communicate those in some way. When I say thin2-gun3 youn2 meaning the color of the robes worn by the Buddhist monks, it will be understood as having the color range anywhere from "dark red" to "dark orange". In the above table, I have listed several colors that are yet to be standardized. For our learning process, we will just use simple "safe" colors that will be understood by all. ain3-ji2 pan3-youn2 beare2 hma2 leare3 -- Where is the pink color shirt? You can re-arrange the sentence. Here's an another version. pan3-youn2 ain3-ji2 beare2 hma2 leare3 -- Where is the pink color shirt? It is OK to add the suffix youn2 to primary colors, too. The following two phrases are both correct and they mean the same: Where is the white color shirt? Which version is better? For standardization in the learning process, I would recommend the second version, a-pfyu2 youn2 ain3-ji2", which adds the suffix youn2 to primary colors followed by the article of clothing. I find this version works all across other phrase constructions in my PHP translation program. a-pfyu2-youn2 ain3-ji2 neare1 lu2 -- The man with the white shirt. hta3 teare1 -- change the verb "to wear" to "the one who is wearing"
which means: "The man who is wearing white shirt." hta3 teare1 is equivalent to the present participle [-ing] in English and "zhe" in Mandarin Chinese. si3 -- literally it means to ride, but here it means to wear the footwear. In a way, you stand on the footwear as if you are about to ride on those. a-meare3-youn2 pfa1-nut si3 hta3 teare1 lu2 -- The man who is wearing black slippers. hta3 teare1 -- change the verb "to wear" to the present participle "wearing". a-meare3-youn2 myet-hmun2 woot hta3 teare1 lu2 -- The man who is wearing black glasses. If you are a tourist, some simple color phrases would suffice. Shopkeeper: ba2 a-youn2 lo2-chin2 leare3 -- What color do you want? chin2 deare2 -- want to + affirmation ending word. Tourist: ho2 a-wa2-youn2 kji1 chin2 deare2 -- Let me take a look at that yellow one. What if there's no yellow item on the shelf? In that case, the tourist cannot say "that yellow one." Tourist: a-wa2-youn2 shi1 la3 -- Do you have yellow? da2 ma1 kjite thay3 bu3 -- No, not this one, I still don't like this one. lain2-mau2-youn2 pay3 ba2 -- Please give me orange color. More advanced-level descriptive words in colors will be continued in the next lesson. But for now, let me regress back to the child's level language by ending this lesson with the nursery rhyme which goes in the same tune as "Ba ba black Sheep." kjite teare1 a-youn2 yway3 ba2 -- Please choose the color you like. ta1-lone2 nga2-pya3 -- 5 pya (cent) each. Note: Although spelled as bau3-lone3, the ball is read or spoken as bau2-lone3.